Description: "Improve your chatting skill with the new stimulator. As mentioned on the front page, this is a quest that is all about typing. And you can't use word select. However, you can use saved words, i.e. pushing up on the d-pad, or hold R and pushing down on the d-pad, etc. Now, you can spend as much time as you want between each room without being penalized, so you can spend that time to setting the shortcuts. You may be asking, "Set my shortcuts to what, though?" Good question, for each room, there are 10 phrases that are used, you won't necessary see all 10 phrases, but there are only those 10 phrases for each room. You can set shortcuts to F1-F10 and hit them using the soft keyboard. There are a few differant types of rooms. There's the battle room, where you keep typing the phrases until you defeat all of the monsters in the room. There's the quiz room, which takes several forms. In one version, you have simply type the phrase, in another version, you have to type the name of a monster, and in yet another version, you have to type a word minus the letters "s o n i c". And on a side note, pay attention to punctuation. 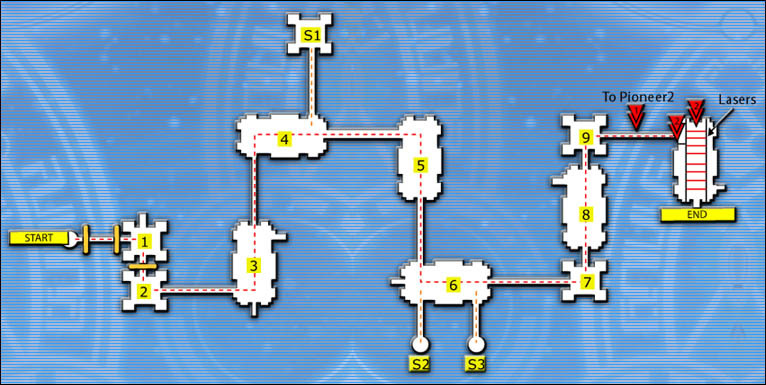 When you get s-rank, which requires to get everything perfect, you will go into a room with a computer that was previously blocked by the lazers. The computer will tell you that you got the chu-chu rocket game. It's not an actual item, though. It's one of those "invisable key items." Simply finish out the quest, and go to the online shop, Pioneer warehouse. The GBA loader will now be active, and you can now download chu-chu rocket whenever you want, as long as you can get online. (You do not need to redo the Reach for the Dream quest). On the Xbox, you can only get 1 mag cell per character. Q. Neutralizes poison in the body. Q. An ice technique. Freezes enemies with ice projectiles. Q. A magic cane with good power and attributes. Q. Currency used on Pioneer 2. Q. A lightning technique. Strikes all surrounding enemies. Q. Reveals traps that are hidden in rooms. Q. A short Photon sword. Attacks enemies twice. Q. I am a ruler of all things. I exist in all places, but I cannot be touched, I cannot be seen or smelt and I never make a sound, what am I? Q. An exceptional cane. Has amazing power. Sacrifice HP to launch a powerful attack. Q. And advanced protective screen for the left hand. Boosts defense, lightning resist for all classes. Q. Increase Evasion Power (EVP) by 2. Attribute will not exceed class limit. Q. A superior sword usable only by masters. Also steals 13% of enemy HP with a special attack. Q. A superior battle cane usable only by masters. Also has a chance to paralyze enemies. Q. Photon Amplifier that boosts the power of Barta techniques. Q. The ultimate weapon?--hard, yet supple and smooth! Q. A superb throwing blade usable only by masters often paralyzes eneimes with a single attack. Q. A superior long sword usable only by masters. Has a high chance of confusing enemies.